I am just like every other mother out there, I have picky eaters for children. I've accepted this fact and so it's not very often that I will try new recipes. I usually make what I know they will eat. However, I ventured into the kitchen yesterday and was feeling the need to try something new. Directions: Preheat oven to 375 degrees. Grease a cookie sheet and set aside. Combine all dry ingredients in a medium mixing bowl. Using a pastry blender or fork, work butter into dry ingredients until butter pieces are pea sized. Combine milk, yogurt, egg, and vanilla in a small mixing bowl and mix well. Then pour mixture into the dry ingredients and mix just until ingredients are combined. Stir in fruit and chocolate chips. Spoon about 1/3 cup of batter for each scone onto greased cookie sheet. Bake for 25-30 minutes or until golden brown. DO NOT over cook. In fact, for best results pull them out when the tops are just barely starting to brown. Eat while warm or store in air tight container or bag. I wanted to let you know that my parents came over for brunch today and I made these to serve with coffee. They were a big hit-- my stepmother asked to take home the left overs! That's for sharing! Those look so very yummy. I may just have to give them a whirl real soon. Was sent by WhipperBerry... will be staying for a while. Incredibly AWESOME! Second time making these in the last 8 days. Half the fun is sharing them and glowing in the reaction! I followed this recipe exactly, and my scones didn't turn out well. 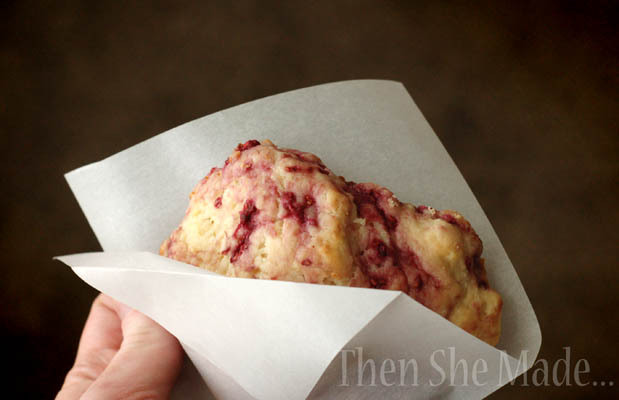 The frozen raspberries let out their juices causing burnt juices under the scones. The top was a golden brown, and the bottom burnt due to juices. When I cut one open, it seemed too moist for a scone, almost under baked. If I were to make these again, I would use fresh raspberries, and a 350F oven temp. Oh No! I'm sorry they didn't turn out. I hope you will try them again. The juices do run out of the raspberries but I've never had them burn like that. Also, a new thing I've been doing that might help is that I've started baking them on parchment paper. This helps with the juices and clean up. I do like my scones soft though, I'm not a fan of the harder kind so maybe that part is just a personal preference. Good luck though and I hope you try them again. I usually get about 12 to 14 per batch. You can get more if you make them smaller but I do mine pretty big. Delicious. I tried it and they were a great hit. Will be making these often! Thank you so much! As a scone connoisseur I have to say these rock! I will definitely be serving these at our bed and breakfast! Holy cow!!!! These are freakin great!!!! I have a high end coffe house near me, and they can't touch these. Very happy at how easy and good they are. Made these for my office for Valentine's Day. Everyone liked them! They were easy to make and next time I will make them bigger.